Even before the publication of the first edition in 1908, Kenneth Grahame's beloved characters appeared in gentle letters from the author to his young son. Those letters and the charming story itself inspired internationally acclaimed artist Michael Foreman to create the luminous illustrations for this unabridged edition. Perfect for gift giving, this exquisite volume features several reproductions of Grahame's letters, along with photographs of father and son, a note about the author, an illustrator's note, and a sewn-in ribbon bookmark. 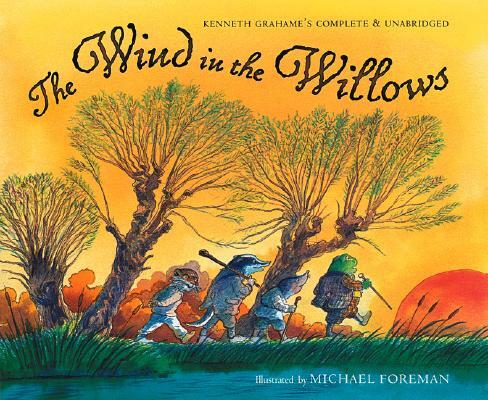 KENNETH GRAHAME (1859-1932) grew up in the village of Cookham Dene in Berkshire, England, which is the setting for much of his masterpiece The Wind in the Willows, originally published in 1908. While pursuing his career in finance at the Bank of England, he wrote poems, essays, and novels. MICHAEL FOREMAN is one of the world's leading illustrators of children's books and the winner of several major awards, including the Kate Greenaway Medal. His work ranges from picture books to fairy tales and original children's fiction. He is the illustrator of many Harcourt books, including Michael Foreman's Mother Goose, Joan of Arc, and Arthur, High King of Britain. He divides his time between London and St. Ives, England, his childhood home.